A group of Tibetans assembled outside the Canadian Parliament, on 2 February 2012, to urge Canadian Prime Minister, Mr. Stephen Harper, to speak out about the human rights crisis in Tibet. Mr. Harper will be meeting with Chinese leaders during an upcoming trip to Beijing. Tibetans gathered for a rally on the front steps of Parliament Hill Thursday [2 February 2012] as Canada’s largest China rights group called on Prime Minister Stephen Harper to speak against abuses in his upcoming trip to China. It is vitally important Harper speak about the “deeply troubling” human rights situation in China, said Alex Neve, Secretary General of Amnesty International Canada. Neve and others from the Canadian Coalition for Human Rights in China said Harper needed to speak publicly for rights for it to really make an impact. The group says abuses are increasing in China and Canada’s growing influence translates into an impetus to speak out. We no longer need to be meek when it comes to be human rights,” said Neve. “To soft pedal, or worse, ignore these concerns risks sending a message that Canada is not concerned,” he said. The coalition wrote to the PM outlining its concerns and calling for the Canadian government to try to secure the release of 10 prisoners of conscience including Canadian citizen Huseyin Celil, Chinese rights lawyer Gao Zhisheng, and others. Cheuk Kwan, Chair of the Toronto Association for Democracy in China, said the list is not all inclusive. “This, of course, is just the tip of the iceberg. China has thousands if not hundreds of thousands of political prisoners in jail,” he said. 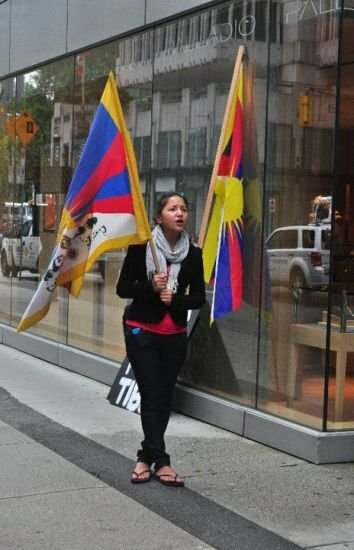 Urgyen Badheytsang, with Students for a Free Tibet Canada, said the situation there is deteriorating with protests inside Tibet being met with violence. “Last week China’s violent attacks in Tibet turned lethal as security forces opened fire on unarmed Tibetans who were protesting for freedom. At least five Tibetans were killed,” he said. Badheytsang said the number is likely much higher but unknown due to media being blocked from Tibet. He said Canada has a proud history of speaking up for others that must not put that aside for trade. He said Prime Minister Harper cannot go to Beijing, sit down with Chinese leaders, and say nothing. Lucy Zhou with the Falun Gong Working Group said the crackdown on Falun Gong constitutes the largest-scale atrocity being committed in China today. “This state-sponsored eradication of Falun Gong constitutes crimes against humanity,” Zhou said. Zhou quoted from the U.S. State Department that noted that half of the inmates in Chinese labour camps are Falun Gong practitioners, numbering in the hundreds of thousands. The U.N. Rapporteur on Torture also reported that two-thirds of victims of torture in China were Falun Gong adherents, she said. Zhou’s group wants the PM to call for the release of 11 Falun Gong practitioners imprisoned in China who are the relatives of Canadians. Neve said the coalition knows it is facing an uphill battle asking the PM to push for rights given his hopes to export Canadian oil. “We know from things [Harper] has said and done in the past that he does care about human rights in China, and he cannot lose sight of that during this visit. It is simply too important a time,” said Neve. Neve noted Harper’s silence on human rights recently, and though Foreign Affairs Minister John Baird made some comments about Chinese abuses during a speech in London, England, Neve said it was critical the Chinese regime hear it from Harper himself. ‘‘We’re not talking about small rights abuses, we are talking about crimes against humanity,” said Zhou. She noted that in China, 1 in 13 people practiced Falun Gong at one point, which amounts to 100 million people, representing a huge portion of the Chinese mainstream society. And beyond this group, numerous others have suffered and continue to suffer persecution by the Communist regime. She and Badheytsang both said that those concerns must be raised publicly. “It has to be done publicly because the Chinese public also needs to know what is going on in Tibet. As you know, China has a really strict control of media inside China and Tibet, and if Harper is able to raise it in public, it will have an immense impact on the Chinese public, not just the Chinese leaders,” said Badheytsang. Neve said issues of human rights need to be raised in all aspects and at all meetings between Canadian officials and their Chinese counterparts, something there is not yet any sign of. Zhou said the regime will not care if criticism of its rights abuses are only raised privately. Canada’s concerns need to be put on the record, publicly, she said.